The history of the State Puppet Theatre of the Republic of Belarus began in Gomel, where in 1938 the Republic Puppet Theater was founded. While forming its repertoire, preference was given to Russian classical plays. The best plays of this period include: «Kashtanka» by Chekhov, «Tale of the pope and his worker Balda» by Pushkin and others. The theatre didn't stop working during the World War II. In 1950, it moved to Minsk and since the middle of the 60s the staff worked on the stage of the cinema «Victory». The staff of the theater didn't only to the plays for children. Experimental performances showed the combination of drama art, music and pantomime. The repertoire included works by Russian and foreign playwrights. Modern period of the theatre development can be characterized as classical one. Staging of the classic has been always considered as the most difficult theatrical problems. But successful performances of the theater show that it is still possible. The staging of Bulgakov's conceptual novel «Master and Margarita» speaks for itself. 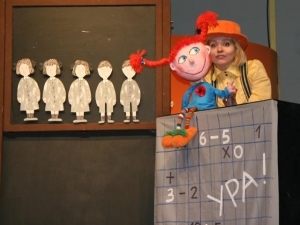 The State Puppet Theatre of the Republic of Belarus tours a lot; its performances at international festivals of Puppet theatres in Belarus, Belgium, Bulgaria, Germany, Poland, Russia, Ukraine, France made the theater world famous.